Then all of a sudden, I saw something that threatened to ruin our perfect family moment. Ella was crawling on the sidewalk now, closing in on a new target: a massive pile of ants that, on her level, probably looked like fun. I knew what had to be done, but I dreaded it. Never in a million years would Ella understand that I had her best interest in mind. The temper tantrum sure to follow would sour all our moods. Nevertheless, I pushed off the ground, ran over and swept her up in the nick of time. From my perspective the timing was perfect, but naturally Ella disagreed. She wailed and kicked and screamed in my arms, angry at me, angry at the injustice. In my head I could imagine her protest: I wasn’t bothering anyone, Mommy. Why’d you pick on me? Couldn’t you find someone your own size? It occurred to me shortly after this event that maybe God feels this way as our guardian. Whereas we see life at eye level, He takes an aerial view. What looks like a good thing to us is often a danger zone, and though it pains him to jerk us off our chosen course, He does it out of love. In the meantime, we wail and kick and scream, mad at the disruption. We miss our old comfort zone, resent the new course we’re on, and wonder why God would pull a fast one on us. Sometimes, we can look back and see clearly the bed of ants we narrowly avoided. We thank God for His wisdom, protection and perfect timing. Other times, the reason’s not so obvious. We believe we’d be better off trucking along as we were, not stuck in a foreign territory. We must rely on faith to trust that God does, indeed, have a plan for us. 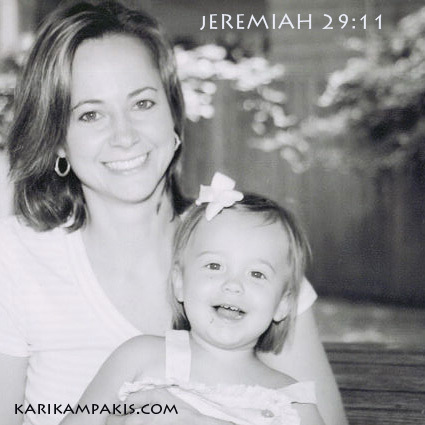 A few years ago, a friend of mine shared a Bible verse that helped her through a difﬁcult divorce. Reﬂecting on her marriage now, she can see how toxic the relationship had become, but at the time she wanted to fight for it. We all have plans for our lives, courses we have mapped out, destinations we want to reach. Sometimes our plans pan out; sometimes they get overridden. But no matter how small and forgotten we feel, God has a plan for each of us. He watches us closely, imposes detours when necessary, and protects us always. And though we don’t always understand His ways, we can rely on His promise of hope and a future, trusting that no matter what happens, He is always with us.